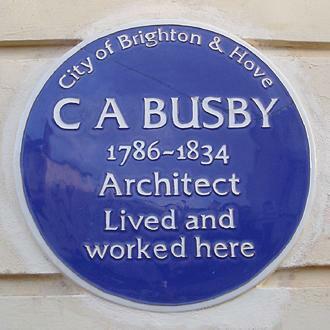 Charles Augustin Busby was born in 1786 but it wasn’t until this year that he, perhaps the greatest of our local architects, was honoured with a plaque of his own. Busby didn’t live long – he died in 1834 – though during his short life he did work prolifically. He can take the credit for building both the Kemp Town and Brunswick Town estates. Both were self-contained settlements that were separated from the nearest buildings by open fields. He also designed Gothic House (known as the old Debenhams building) opposite Waitrose on Western Road along with many others. Two blue plaques have in fact been installed for Busby this year (the first cracked!) on what was once his family home, 2 Lansdowne Place. The development, originally named Stanhope Place after his son, was his last work in the area. The plaque was unveiled by Brighton & Hove City’s mayor, Carol Theobald. Much has been written incorrectly about Busby’s relationship with Amon Wilds and, his son, Amon Henry Wilds. For many years it was believed that Wilds Snr worked jointly with Busby on the Kemp Town development which includes Sussex Square and Lewes Crescent. However, I can confirm that Busby worked solely with Wilds Jnr. On Brunswick Town, which includes Brunswick Square and Brunswick Terrace, he worked alone. Busby’s great rival was Charles Barry. St. Andrew’s Church on Waterloo Street was built by Barry adjacent to Brunswick Town much to Busby’s annoyance. Barry was chosen over the Busby/Wilds Jnr partnership to design both St. Peter’s Church and the Royal Sussex County Hospital. Barry became Sir Charles after designing the Houses of Parliament, one of the greatest buildings of all time. Wilds Snr is buried in St. Nicholas’s Churchyard in a beautiful grave with a giant shell motif that was designed by his son. However, Busby’s final resting place cannot be confirmed. He was buried within the grounds of St. Andrew’s Old Church in Hove (not to be confused with St. Andrew’s Church beside Brunswick Town). Either a road or a building is now above him and the whereabouts of his tombstone is not known. I have heard though that some of the stones became steps to front doors in the Cliftonville development which was built soon after the graveyard was mangled. Some good news is that Wilds Jnr’s grave has recently been unearthed and I will be writing about it shortly.